If you are reading this, then I need you! 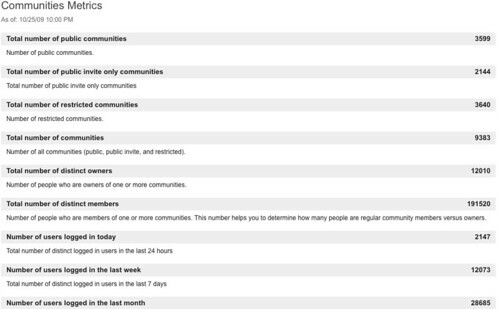 I need your feedback on what kind of metrics you need (or you've been asked to provide) for Lotus Connections, especially around Communities. Last year, I showed you some of the sample reports generated by Lotus Connections 2.5. For those of you who have Lotus Mashups, you probably already know how to create custom reports for Lotus Connections. Perhaps you are already capturing some analytics in Lotus Connections using Google Analytics. As our release of Lotus Connections next prepares to go out the door soon, we are already planning on what Lotus Connections is going to look like in 2011. Therefore, we would love to have your feedback and incorporate early in the planning process. With that said, please head on to this blog entry and leave your feedback there. Hope to hear from a lot of you.